(WOOD) — Grand Rapids police are investigating a dog attack that killed a 3-week-old girl. It happened around 6 p.m. Thursday at a home in the 1100 block of Kalamazoo Avenue SE. Sgt. Terry Dixon with the Grand Rapids Police Department said the baby was left alone in a glider, similar to a bouncer, while several adults were on the porch. One of the adults went to check on the infant after approximately five minutes and noticed she had been bitten, Dixon said. A PIT BULL was near the child with blood around its mouth, detectives said. Police say they were notified about the situation at 2 a.m. Friday by Helen DeVos Children’s Hospital, where the baby had been taken. The infant underwent emergency surgery but died Friday morning, officers say. An autopsy on the baby girl showed her injuries were consistent with a dog bite. “This is a very, very tragic situation,” said Dixon. “This is a horrible tragedy and serves as a critical reminder to never leave a child unattended around a dog or dogs or cats. Always keep a watchful eye on vulnerable youth, and that’s what makes this difficult to report on,” he later added during a Friday afternoon news conference. Two other dogs were also in the house but not nearby, according to Dixon. He said the three dogs were not confined to an area in the house. The dogs were taken to Kent County Animal Shelter where they are under quarantine. All three are pit bulls, GRPD confirmed. “I don’t think you, just the breed of a pit bull by itself is not enough to condemn it. Any dog can bite,” Dixon said. At least one other child lives at the home, Dixon said. Child Protective Services has been notified of the situation and is investigating, he said. GRPD said no one has been charged in the case, but officers will sit down with the prosecutor’s office to determine if charges are warranted. Officers are not releasing names of the infant or those involved in the case at this time. 11) PENDING - 5-7- JAMES DERLE PATTERSON - 63 - JACKSONS' GAP TALLAPOOSA COUNTY AL- Patterson was riding a small gas-powered scooter about a mile from his home on Alf Road- A caller reported the incident at 4:13pm that "dogs" had attacked a man - He was found unresponsive with wounds consistent with a dog attack and was pronounced dead at 5:37pm - He was found about 15 yards from where his scooter was found..... in the road - The road is a dead end and located in a rural secluded area - There were "beware of dog" signs posted on the property - The breed or breeds of the dogs have not been identified. No, let's not condemn the pit bull breed. Any nanny dog can bite and kill a 3-week-old baby. It's just all of the other baby killing dog breeds don't make the newspaper. The other dog breeds have better advocacy, and those advocates keep the reporting of fatal attacks under wraps. It's a conspiracy. Normal dog breed advocates do this to make pit bulls look bad. I wonder how nutters can deny how dangerous their animals are. 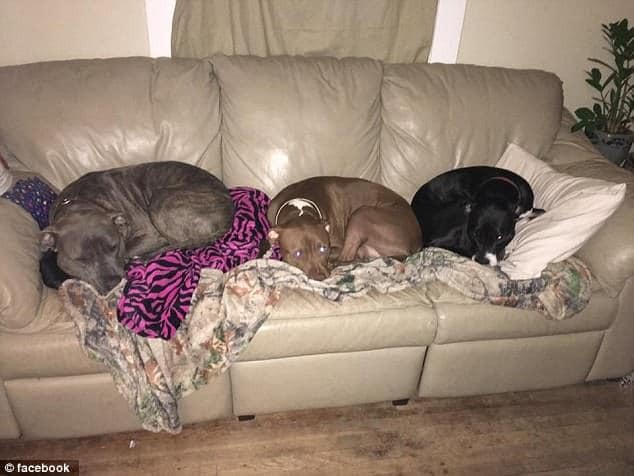 3 pits in the household? That poor baby didn't have a chance. Seeing the photos of the innocent babies slaughtered by pit bulls always makes it that much harder to fathom. This nutter mother bought the nanny dog lie, and left her baby unattended. I'm sure the other nutters are throwing her under the bus. I won't bother reading the comments, because all of them will perpetuate the carnage. Never leave babies unattended with nanny dogs! It's the owner, not the pit bull! It's all in how you raise them! When are we going to get serious about these deadly dogs? When are we going to stop the idiocy of pit bull advocacy? Since when are pit bulls' lives more important than that of a human baby? The numbers say it all,pit bulls have more attacks then all other breeds together. Time to put them all down. The updates from dogsbite.org are condemning. The teenage sister of the baby killed posted a photo of the baby with one of the family pit bulls. It is not the suspected baby killing pit bull, but it is one of those photo ops that shows how wonderful pit bulls are around sleeping babies. The seriously messed up thing about it is, the photo was posted after the baby's death. The biggest problem with pit bulls are the nutters themselves. They are so indoctrinated in the belief that pit bulls are safe pets, that they will not change their viewpoint even after a pit bull has killed one of their own. If they don't care about their own babies, why would they care about any of us? They don't and that is what we are up against. Breed specific legislation is long overdue. I'm sick of the nutters making themselves the victims. There are stories out there of "families being ripped apart" because the pit bull lives in a breed specific town. Nutters choose their dog breed knowing that it is dangerous, then cry "victim" because they are discriminated against. I'm sorry, but until any nutter experiences their pit bull getting randomly targeted and killed, they are not victims. Having their pit bull shot by a police officer because it is attacking something, does not make them a victim. There is not one thing a pit bull does, that a regular dog cannot do. It's time to let pit bulls go extinct. It's better them than us.